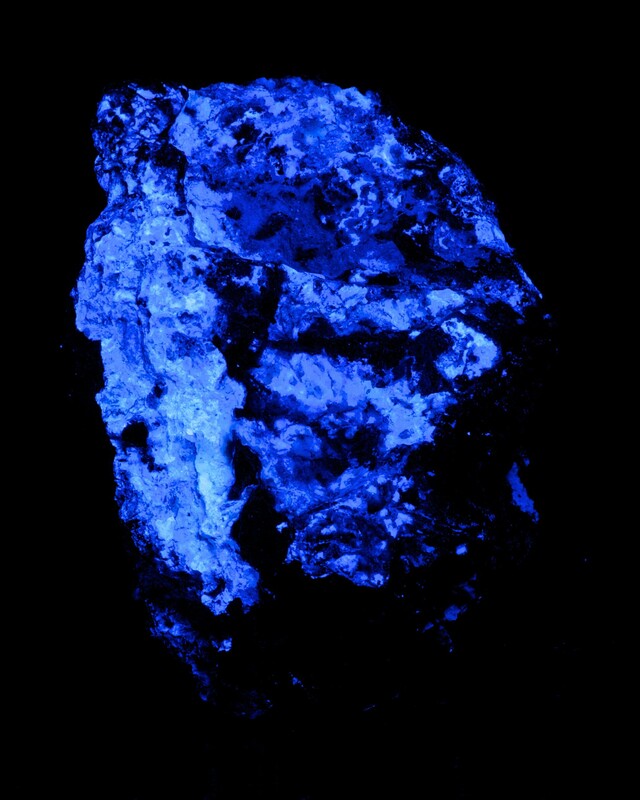 Over 500 minerals have been discovered that exhibit some sort of fluorescence when exposed to ultra violet light. 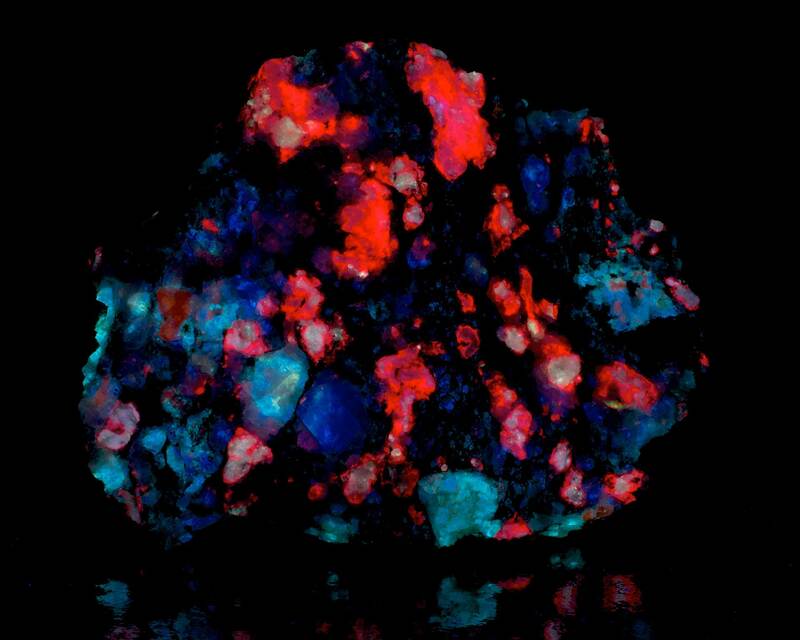 What follows, is a collection of some of the more common and/or well-known fluorescent minerals. 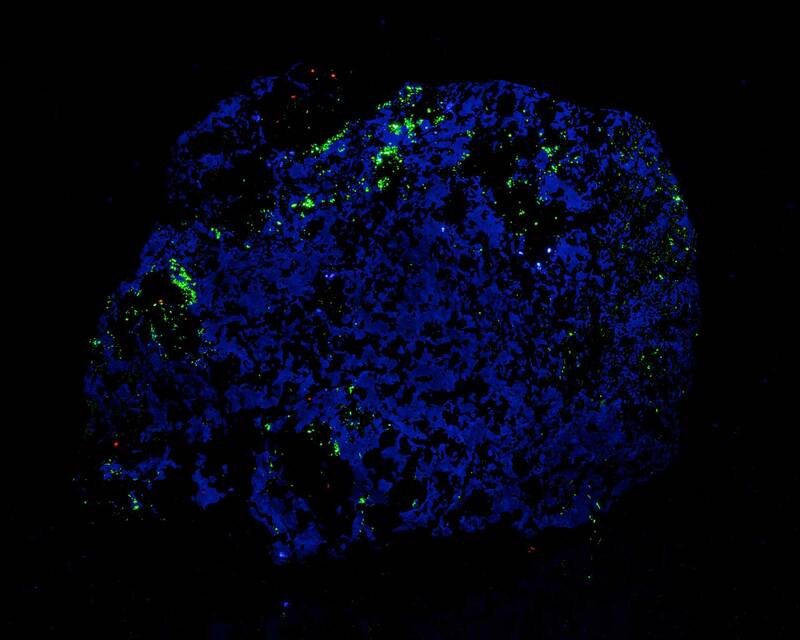 Importantly, not all specimens of these minerals will fluoresce, as minerals typically require an ion actuator to glow. Originally known as fluorospar, fluorite gave birth to the phenomenon fluorescence, first discovered and named by George Stokes in 1852. 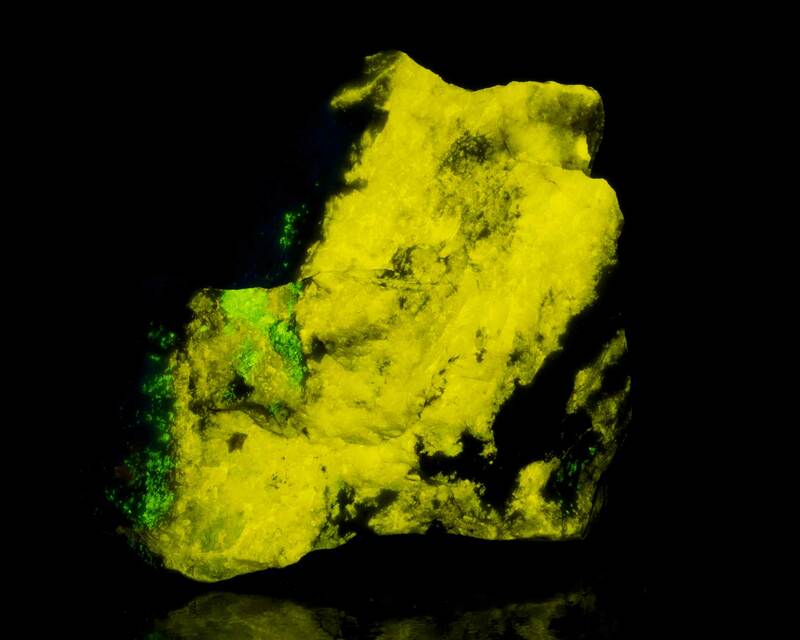 As the first, official fluorescent mineral, it’s at the top of the list. 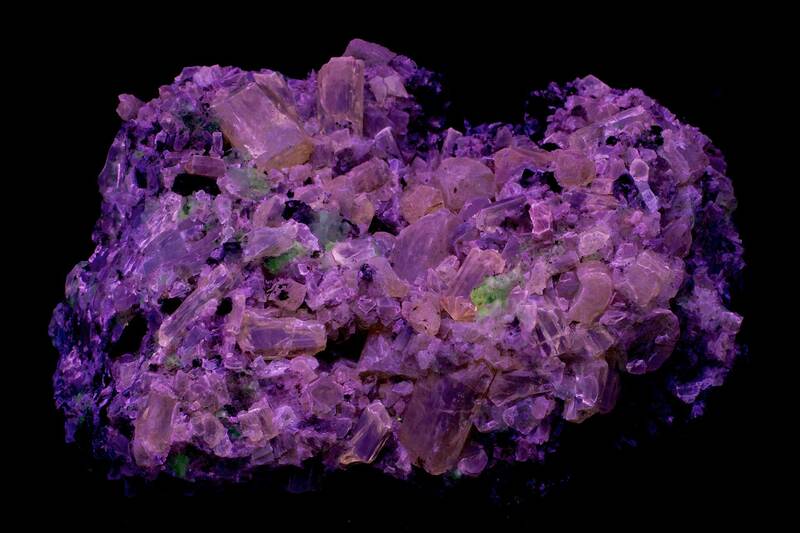 Though it can be found around the globe, fluorite almost always fluoresces. 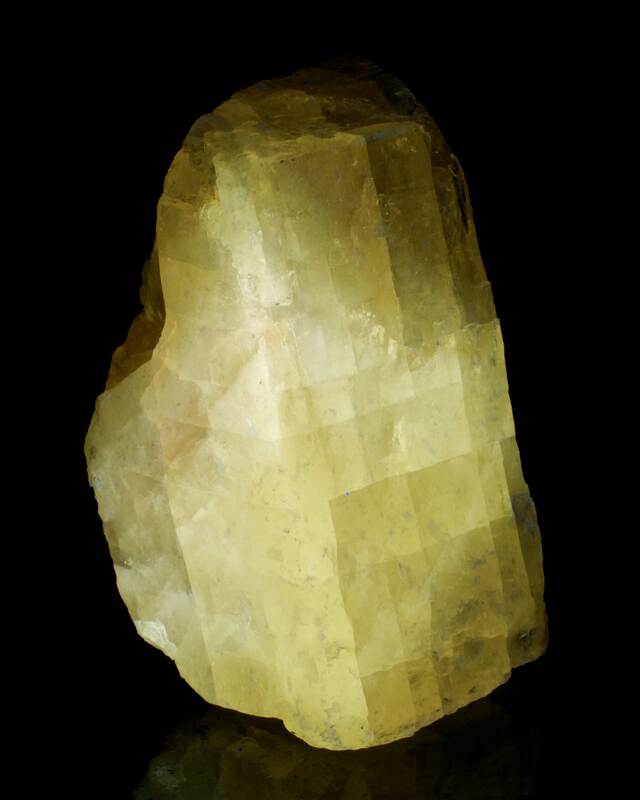 Probably the most common fluorescent mineral, calcite is a carbonate mineral that can be found throughout the world. Calcite also comes in a variety of interesting habits, or shapes, that can resemble poker chips, dogteeth, flowers, columns, and simple blocks. 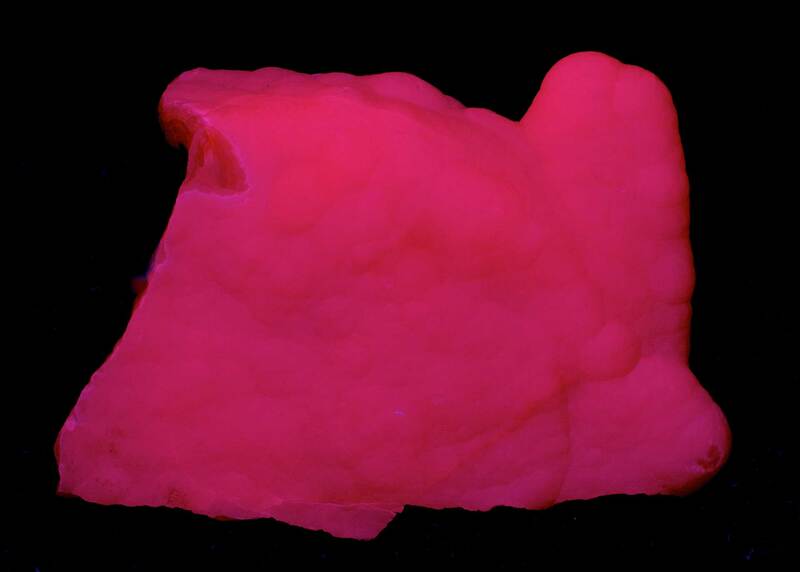 Those shapes, combined with the array of colors that calcite can fluoresce, makes calcite a very diverse and fascinating fluorescent mineral. Agrellite is a relatively rare mineral that’s found only in the Kipawa Alkaline Complex in Quebec, Canada and a few other locales. 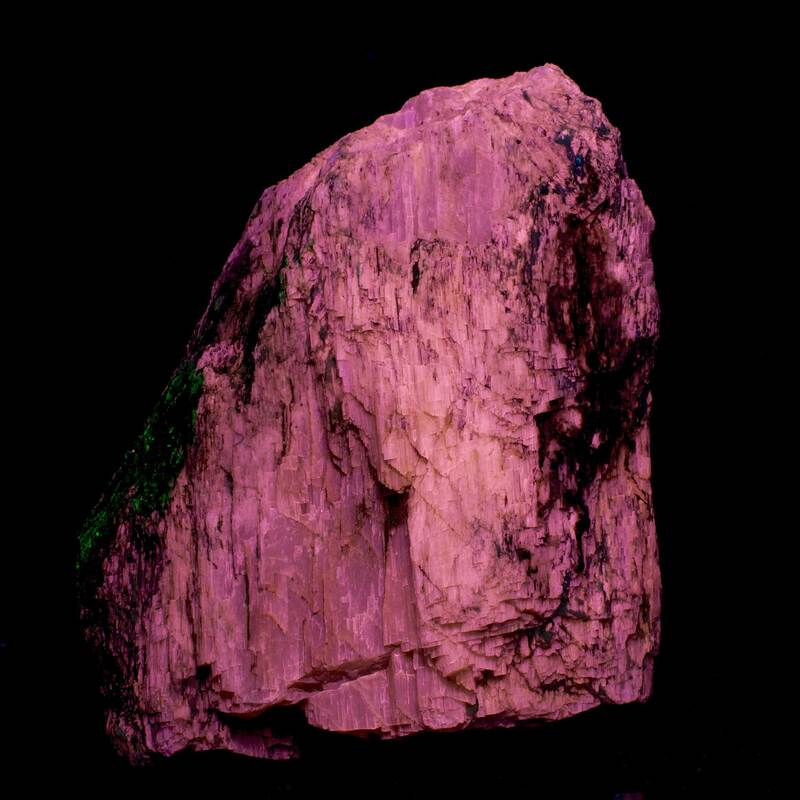 With its beautiful deep pink fluorescence, though, agrellite is a fairly common addition to many fluorescent displays. Apatite isn’t a single mineral, but refers to a group of phosphate minerals that includes fluorapatite, hydroxylapatite, and chlorapatite. 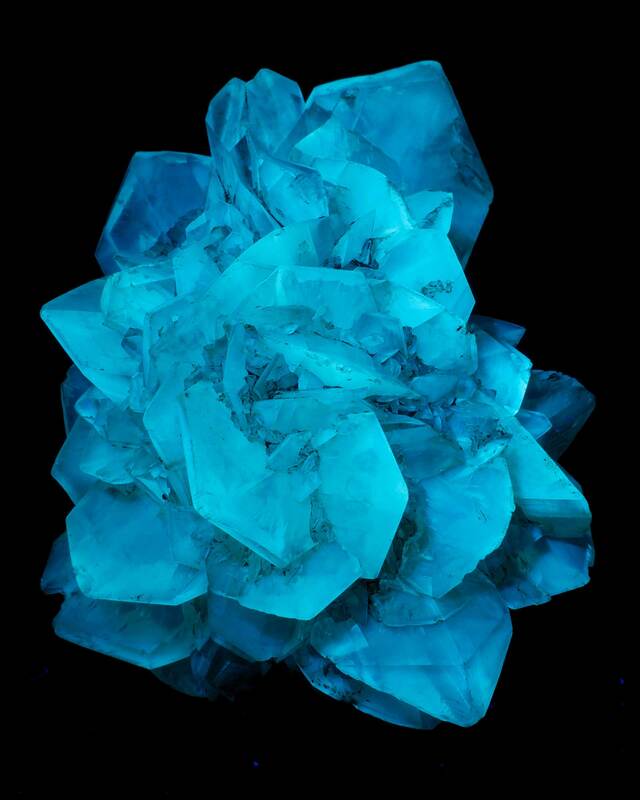 Fluorapatite is by far the more common variety and can be found in both prismatic crystal and massive habits. 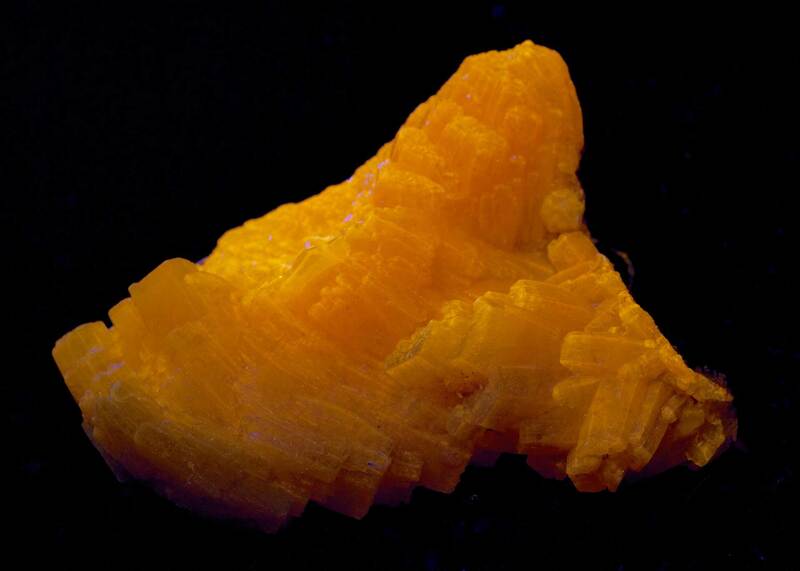 Similar to calcite, aragonite is another common carbonate mineral. Aragonite is often formed through precipitation in both salt and freshwater environments, creating stunning specimens reminiscent of flowers or coral. It can also be found as crystalline layers within specimens that include other minerals as well. Baryte is a barium sulfate mineral that typically can be found as tabular crystals of varying thicknesses. Occasionally, baryte can also be found as sets of bladed white masses intermixed with other minerals. The name cerussite is derived from the Latin word, cerussa, meaning white lead. Cerussite is a lead carbonate, and interestingly, lead is often an actuator for fluorescence in mineral specimens. Typically found as collection of crystals, cerussite can also be found in granular massive habits. While not a true mineral in and of itself, chalcedony loosely refers to several varieties of silicon dioxides primarily consisting of microscopic crystals of quartz and sometimes moganite. Chalcedony is often botryoidal or rounded in habit, and is fairly common in geodes and hydrothermal mineral deposits. Rubies and sapphires! Both are varieties of corundum, an aluminum oxide. Rubies are an extremely fluorescent red under long wave and can be found as large masses in both fuchsite and zoisite. 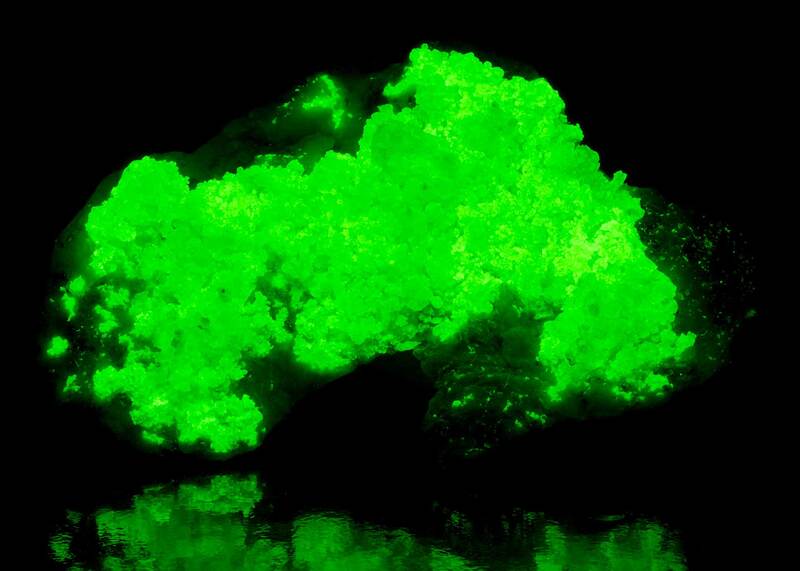 A rare and very sought after fluorescent mineral, esperite is found only in two locations in the world, the Parker Shaft of the Franklin Mine and the El Dragon Mine in Bolivia, with the latter appearing only as microcrystals. 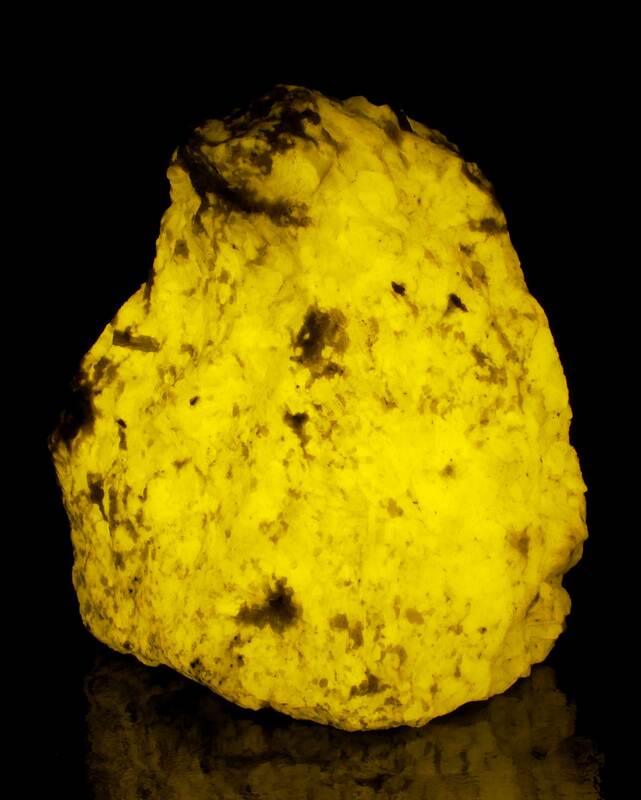 Esperite fluoresces a bright canary yellow, and is often associated with willemite, calcite, and hardystonite. Until recently, hardystonite was thought to only occur at the Franklin Mine in New Jersey. However, the rare calcium zinc silicate material was also found in small amounts at the Desert View Mine in California. Not the brightest of fluorescents, hardystonite does glow a beautiful midnight blue. Also known as water-clear opal and opal-an (for amorphous network), hyalite is a glassy and clear form of opal. 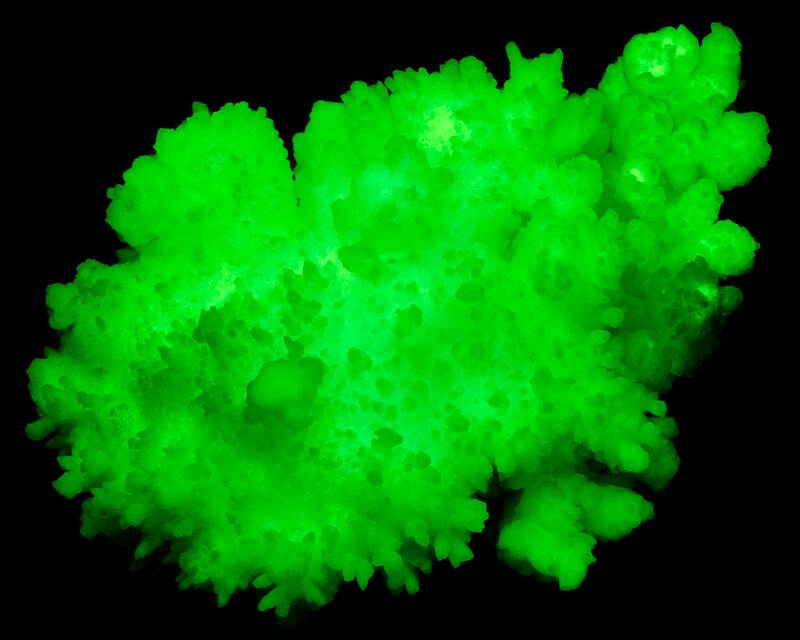 Typically found in globular or botryoidal habits, hyalite can be extremely fluorescent, glowing a very bright green. Some of the brightest specimens hail from North Carolina, Hungary and Namibia. 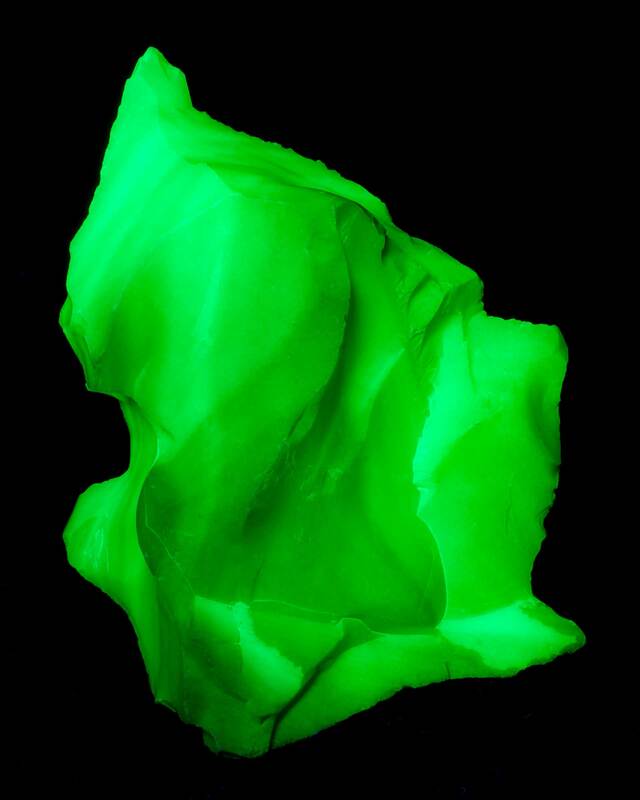 Recently, hyalite from Zacatecas, Mexico was found to be fluorescent in sunlight. Hydrozincite is a zinc carbonate that typically forms as an oxidation product of zinc ores. Often found as a powdery encrustation, hydrozincite can also be found as massive and botryoidal habits. Common opal is opal that doesn’t show any fire or iridescence. Most fluorescent common opal is amorphous and can be found as beautiful, sinuous specimens. 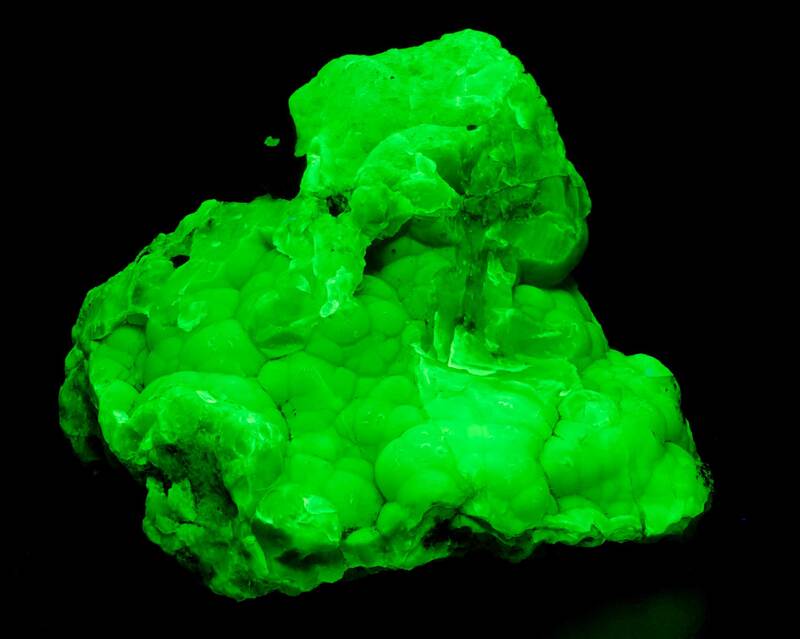 The typical bright green fluorescence is attributed to activation by uranyl ions. 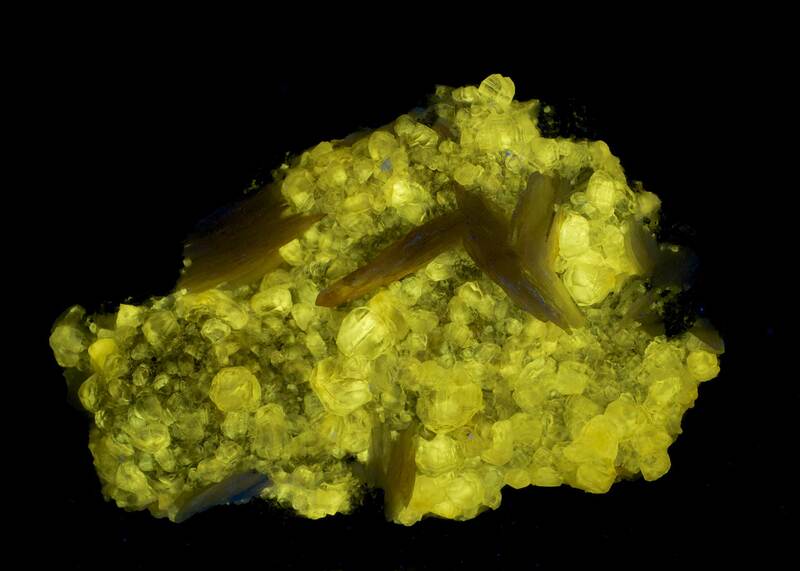 Until recently, pyromorphite wasn’t on the fluorescent collector’s radar. Though pyromorphite barely fluoresces under the more traditional short wave or long wave lights, some specimens explode with color under mid-wave UV. Additionally, recent finds from China that include plumbogummite pseudomorphs along with pyromorphite are truly spectacular under mid-wave light. Again, scapolite refers not to a single mineral, but to a group of aluminosilicate minerals that include end members meionite and marialite, as well as the archaic monikers wernerite and mizzonite. Scapolite is found more commonly as a grainy, massive habit, but can also be found as prismatic crystals. Scheelite has made a couple of noteworthy contributions to the fluorescent mineral hobby. A calcium tungstate, scheelite ore is an important source of tungsten. As the demand for tungsten grew significantly during World Wars I and II, miners headed to the western mountains armed with rudimentary black lights in search of the material. 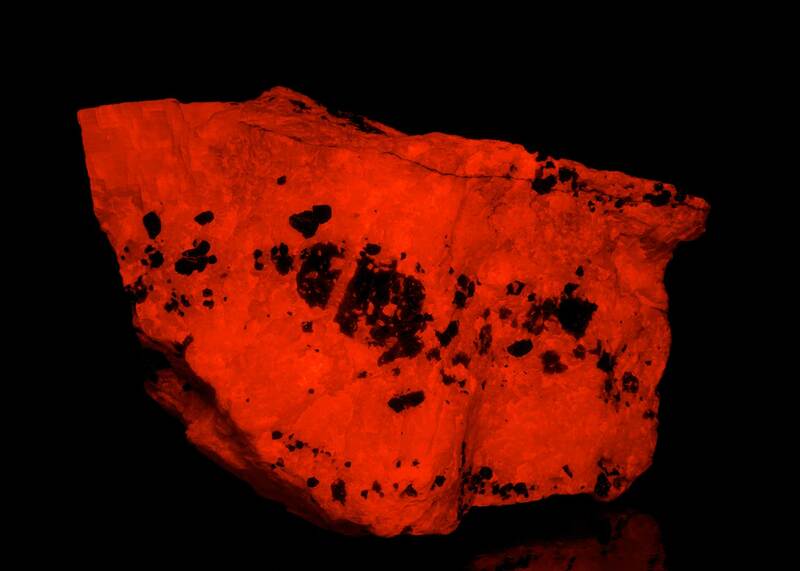 Consequently, many improvements to portable UV lamps and countless great fluorescent mines in the West owe their existence to scheelite. A crystalized form of gypsum, selenite comes in several familiar forms in addition to the common transparent crystals and include satin spar, desert rose, and gypsum flower. Some transparent selenite crystals exhibit an “hourglass” pattern under UV light that is not visible in natural light. 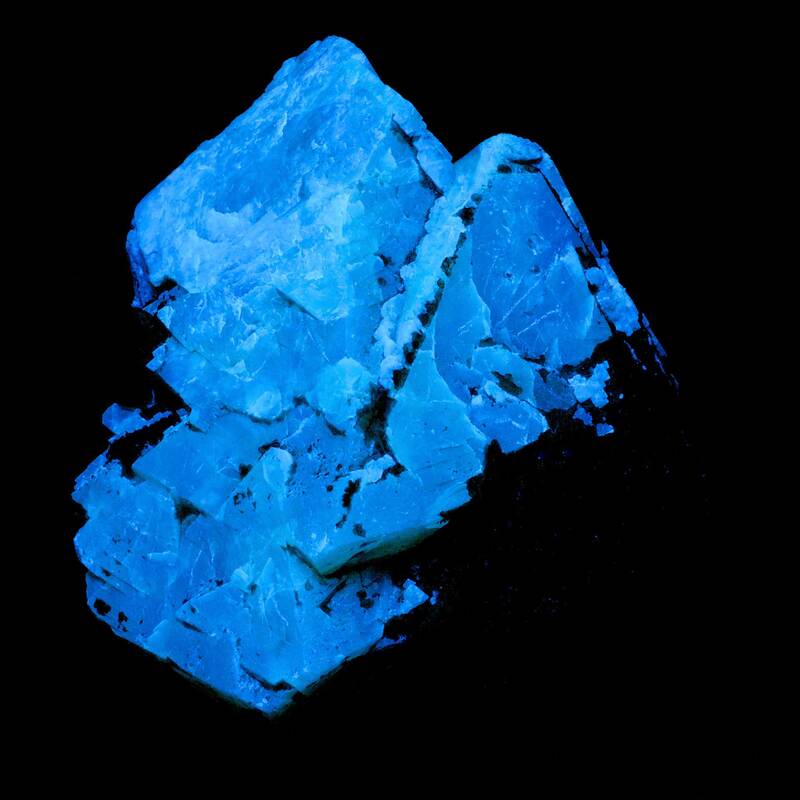 These crystals are also phosphorescent. After the UV light source is removed, the hourglass pattern remains briefly visible then fades away. A zinc carbonate, smithsonite is typically found as botryoidal or massive habits within specimens including associated minerals. Common associations include willemite, hemimorphite, cerussite, and fluorapatite. Specimens can be found in Greenland, Quebec, China, South America, Africa, Afghanistan, New England, and even along the shores of the Great Lakes. A variety of sodalite called hackmanite, exhibits tenebrescence, a temporary darkening of the crystals when exposed to ultraviolet light. 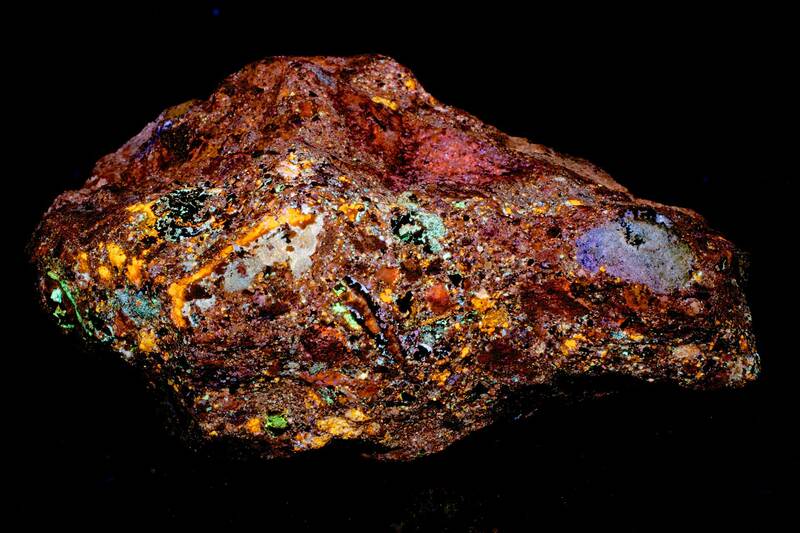 While most fluorescent specimens of the mineral exhibit an orange fluorescence, sphalerite can fluoresce in a rainbow of colors. 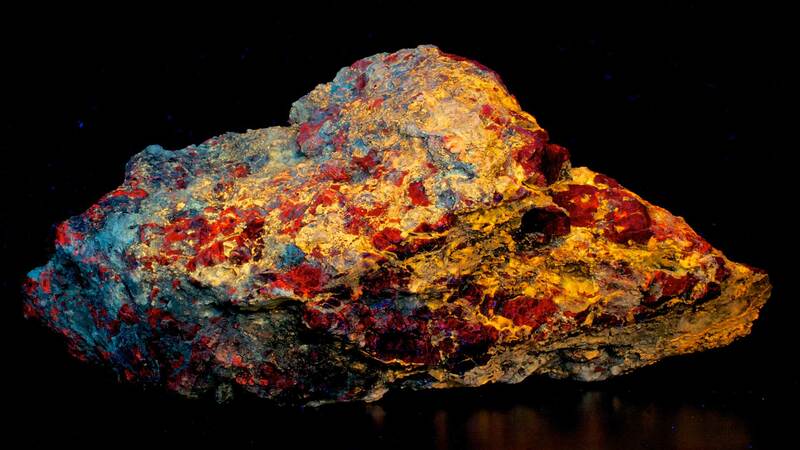 A zinc sulfide, sphalerite is the most common and most important zinc ore in world. Sphalerite typically occurs as well-formed crystals in a variety of sizes. 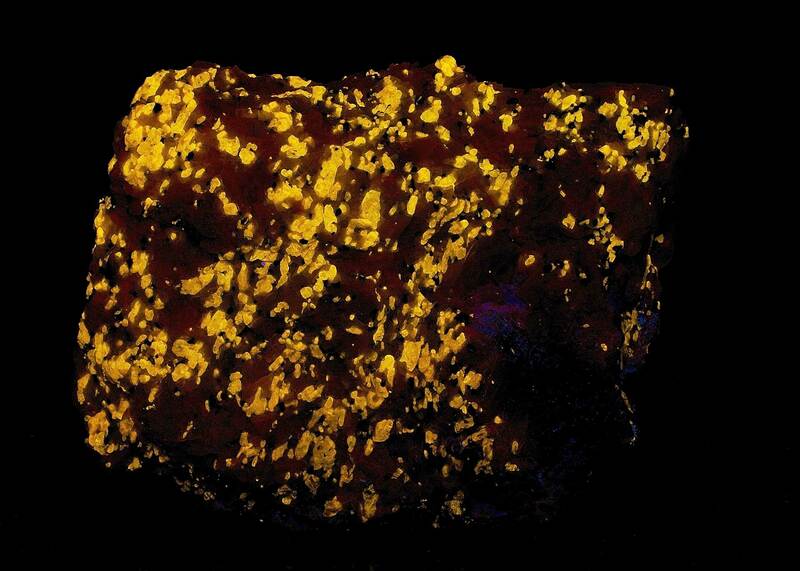 Interestingly, micro-crystals of sphalerite sometimes cover pyrite, giving it a surprising red fluorescence. 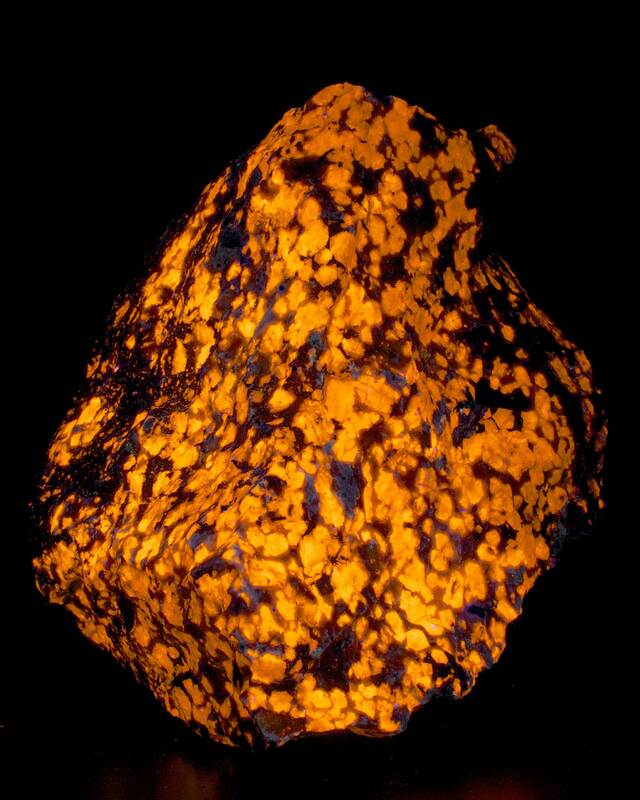 Sphalerite can also be highly triboluminescent, as well. What’s in a name? Over the years, tremolite has been often used as a catchall name for fluorescent minerals from the asbestos family. Manganocummingtonite (aka Tirodite), anthophyllite, and tremolite are virtually indistinguishable in the field and are all members of the amphibole group of silicate minerals. Regardless, they are beautiful fluorescent specimens and exhibit triboluminescence, as well. Handle with care, as they all are asbestos. Inuit for reindeer blood, tugtupite is a rare beryllium aluminum tectosilicate found primarily in Greenland, though it has been found in Quebec, on the Kola Peninsula in Russia and along the rivers in Nepal. 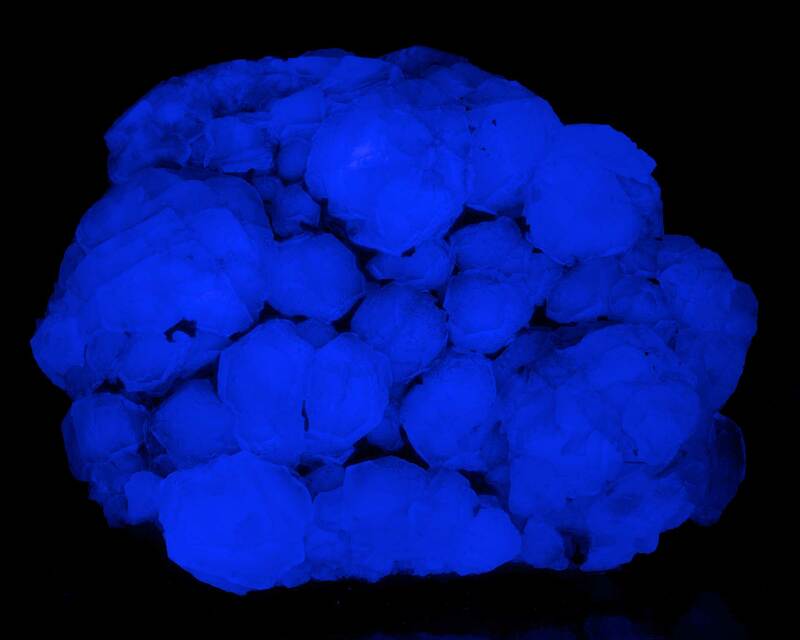 Brightly fluorescent under ultraviolet light, tugtupite also exhibits tenebrescence. 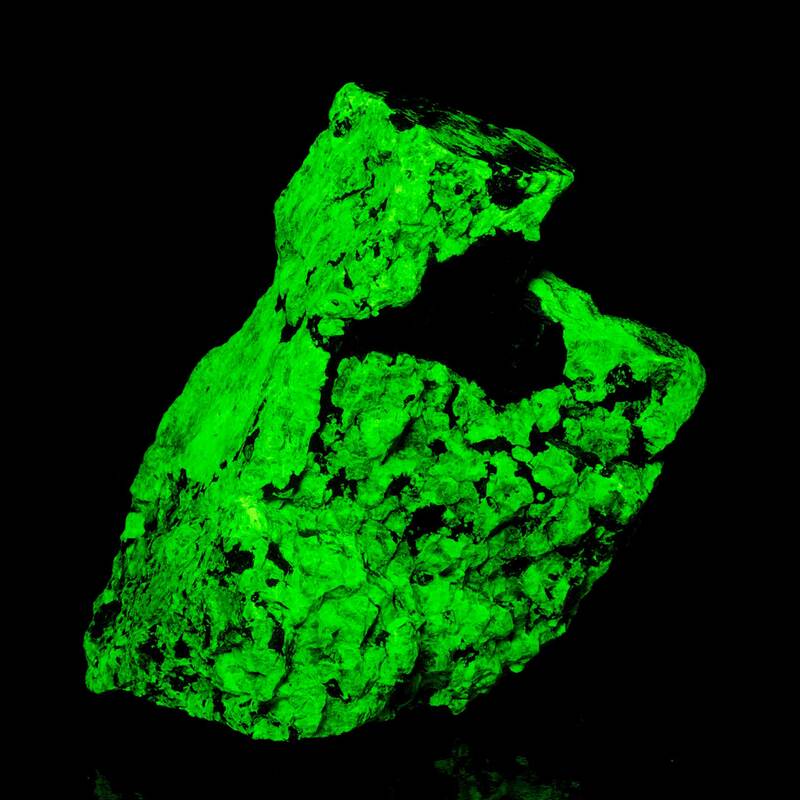 A zinc silicate, willemite is well known for its extremely bright green fluorescence, though it can fluoresce in other colors, as well. In daylight, willemite can be found in a variety of forms and colors, from apple green gemmy crystals to blood red masses. 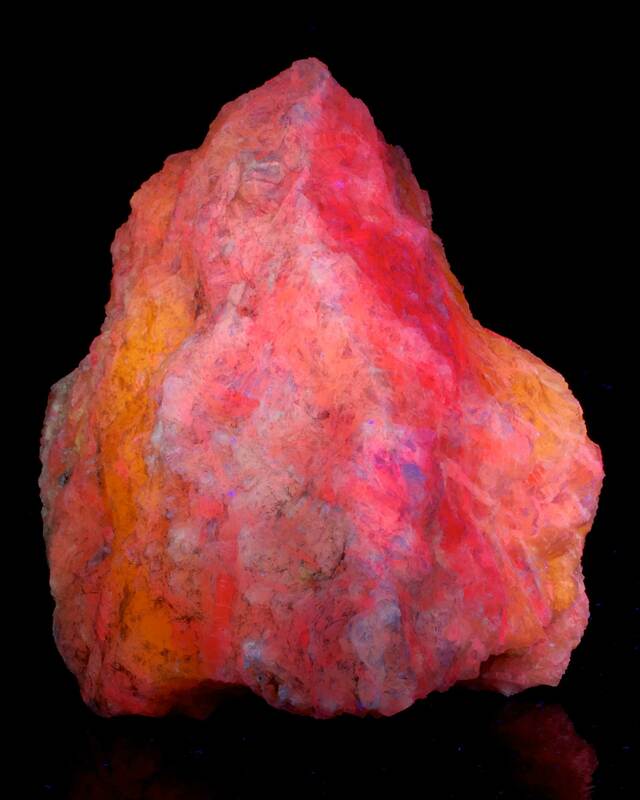 Willemite is often very phosphorescent, with some afterglow lasting for hours. Wollastonite is an important industrial mineral with a wide variety of applications. With its needle-like structure, the calcium inosilicate is similar to asbestos, but is non-hazardous and is used as a fire retardant, to strengthen plastics and ceramics, as a flattening agent for paints, and as an additive in friction applications. Of course, many specimens are fluorescent, some varying colors under different wavelengths. 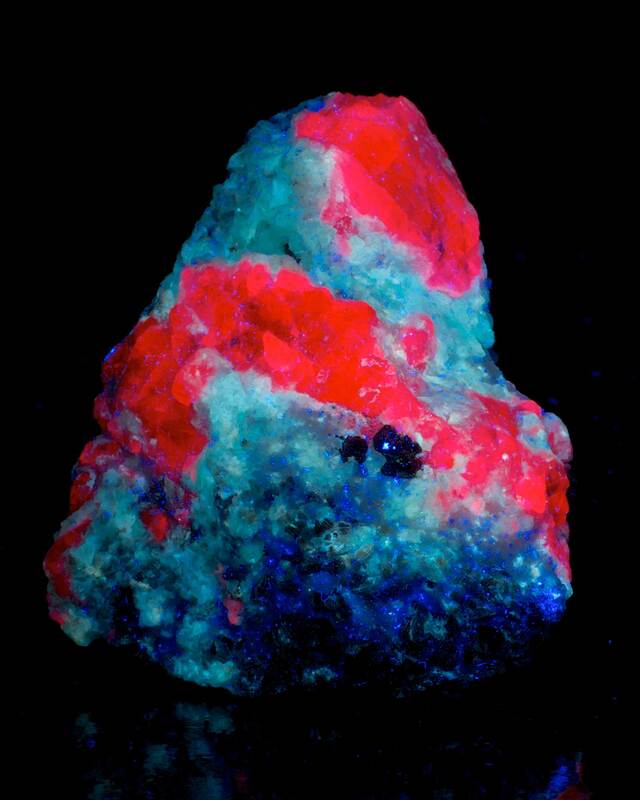 Some might consider adding caliche to a list of fluorescent minerals as heresy; after all, it’s not a mineral. Instead caliche is a mineral deposit, a natural cement of calcium carbonate binding other materials such as silt, sand, and gravel together into an extremely hard conglomerate. Common to arid and semi-arid regions, caliche is often fluorescent and adds stunning color to many specimens from the Desert Southwest and South America.